I fell in love with Basmati rice the first time I tasted it, and I’ve been cooking with it ever since. Basmati is a long grain rice, usually grown in India. It has a slightly nutty flavor and a delicate scent. The extremely long grains become even longer when cooked, and it cooks up reliably light, fluffy, and non-sticky. Jeera Rice (cumin rice) is my favorite way of cooking Basmati rice. I usually cook up a huge pot of jeera rice at the beginning of each week. It’s perfect for Indian recipes (of course!) but it also works well with any kind of chili, Mexican foods, and most kinds of beans. Or you can serve it as a side dish. The most important thing is to sort, wash, and rinse your rice. Most Americans do not know how to do this, because most of the rice we buy in chain groceries is already “pre-washed.” Washing and rinsing removes a significant amount of pesticides and contaminants. 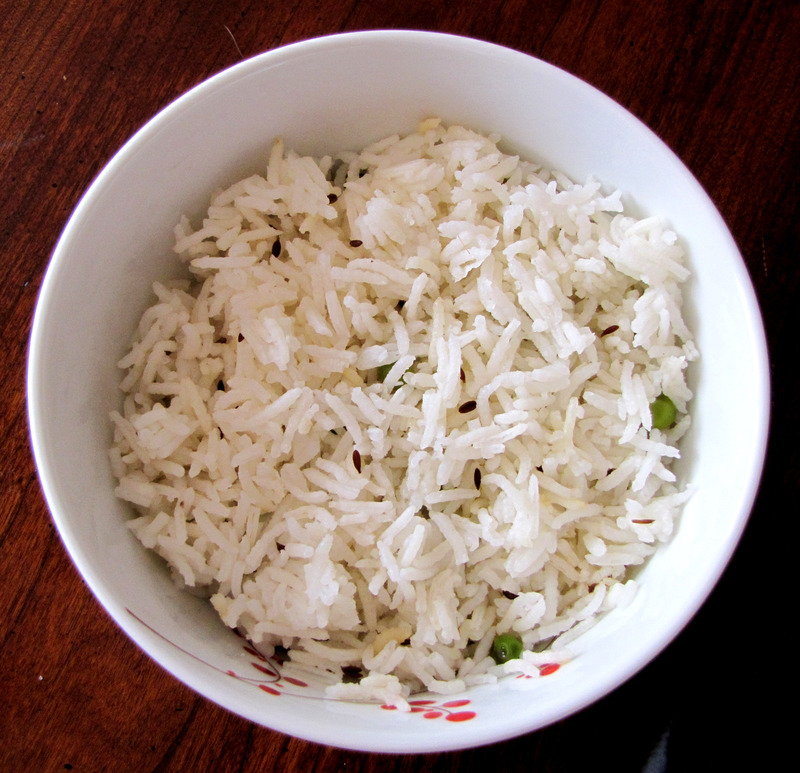 In addition, it removes excess starch, which is absolutely key to a light and fluffy rice! First, place a measure of rice on a plate and quickly look through it for anything that shouldn’t be there. You never know. 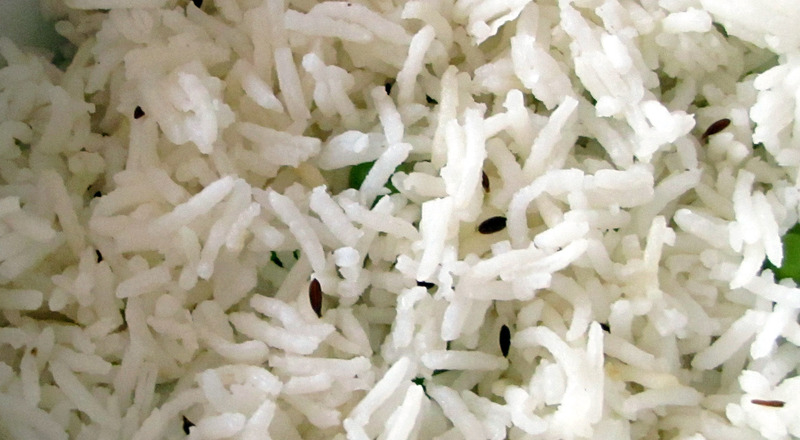 Sometimes you may buy a bag of rice with bugs, or bugs could infiltrate your rice once it’s in your pantry. I usually sort rice a half-cupful at a time. Put the rice in a large bowl. 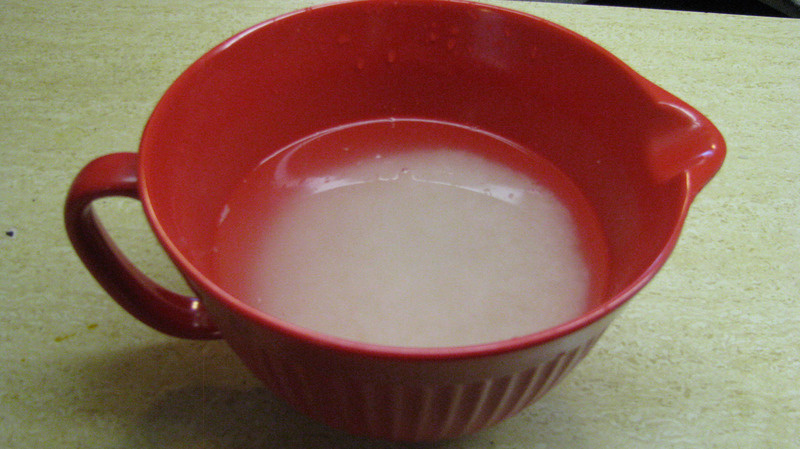 I use a batter bowl for washing and rinsing rice – it’s perfect! Cover the rice with water. Put your hand in the water, grab a handful of rice, and “scrub” the grains together in your hand gently. Release. Pick up another handful of rice and scrub. And another. 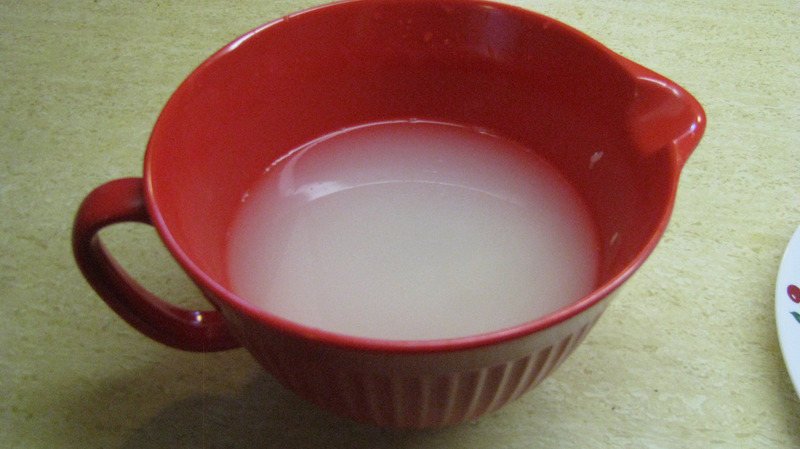 Your water should soon look white and cloudy. 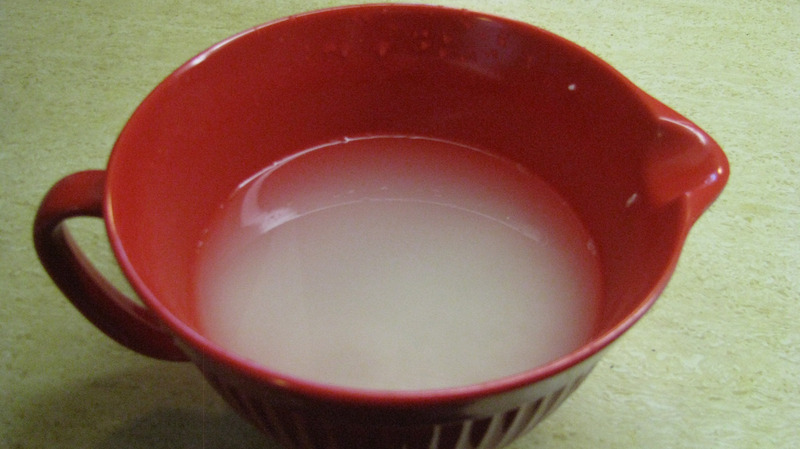 Drain the water from the bowl and repeat the process until the water is nearly clear. After first scrubbing in water. 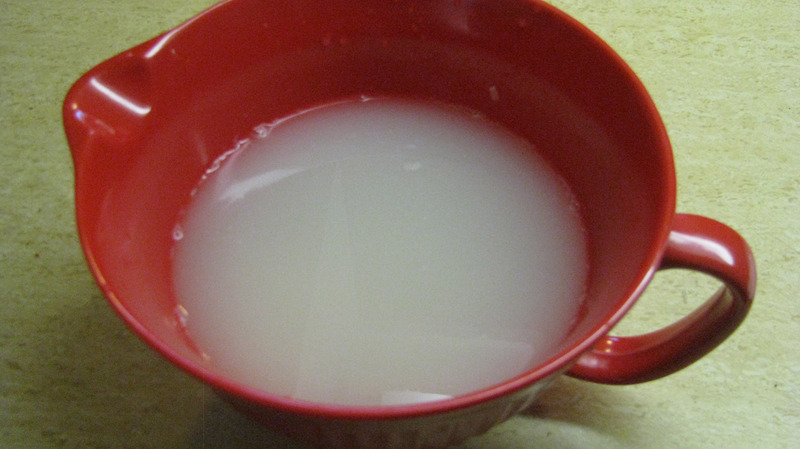 Notice how the water is white and nearly opaque. After second scrubbing in water. After third scrubbing in water. Notice the water is beginning to look clearer. After fourth scrubbing in water. Notice the water is almost clear now. Now you’re ready to cook your rice! Sort and rinse your rice. In a large pot, heat the vegetable oil. Once it’s warm, toss in the cumin seeds and cook until they start to “pop” (usually no more than a minute). Be careful not to let them burn. This is tricky because now you have to add water to the hot oil. I do it by pouring the water in at the back of the pot, while using the lid as a shield at the front of the pot to protect myself from splatters. But since I don’t have a video to demonstrate, and I don’t want anyone getting burned, one option is to simply remove the pot from the heat and let the oil cool before adding the water. After you add the water, add the rice, salt, and frozen green peas. Bring to a boil. Once it boils, cover the pot and reduce heat to low. Cook for approximately 15 minutes. Remove pot from heat and let stand 5 more minutes. When you remove the lid, usually the cumin seeds will have congregated together in the middle of the rice or sometimes at the outer edges. Just fluff the rice with a fork and gently mix the cumin seeds into the rice. For a pretty yellow color, you can add 1/2 teaspoon turmeric to the rice when you add the salt. Save time by doubling the recipe and making a big batch of jeera rice at the beginning of the week. Leftover rice heats up very nicely in the microwave. Sometimes I omit the salt. If I accidentally make my beans too salty, serving over unsalted rice goes a long way towards remedying that problem. If you grew up in the American South you may sometimes crave “just plain, buttered rice.” Simply omit the vegetable oil, cumin, and peas. When the rice is finished cooking, stir in some Earth Balance. You’d think I’d know how to make rice. Obviously not! Thanks so much for that cool detailed instructional blog. I always thought the strainer was enough. Never thought about putting in a bowl like that. Now what about quinoa? I can only imagine what I’m missing here! Lol!! I used to use a strainer, too! But washing the rice several times in a bowl really does make a difference – whether it’s Basmati or regular old Uncle Ben’s. As for quinoa – I have to admit I haven’t quite figured that one out yet! That’s a great idea. I’ll have to try that. Oh, definitely! This is just a base recipe, what to use with your usual Indian and Thai curries. Feel free to add to it anyway you want. I’m a little embarrassed to say that I had to google this – I’m an Indian-American guy (born and raised in Chicago) and i’m trying to get some dinner ready for my wife! Thanks for helping out, she always likes her rice made on the stove with cumin so this should be perfect! Thanks, hope it turned out well! I am so grateful to you. I have made this type of rice several times (as well as other Indian dishes with whole cumin) and I burn the cumin every. single. time. This time I decided to search google for an easy-to-understand recipe in hopes that I could possibly avoid what I’ve always done wrong. Your explanation was superb and this was the first time I was able to make jeera rice like the restaurants! It was so delicious, and the cumin seeds were perfectly cooked. Thank you! I’m glad it worked out for you! 🙂 Don’t feel bad about burning the cumin seeds in the past; I would never have known how to cook jeera rice either if I hadn’t been taught in-person.